As the year is quickly drawing to an end, I notice my friends reflecting on the year that was, and hoping and planning for the year that will be. In the spirit of taking stock of my life, I have a confession to make. I, the one and only Cuban Reuben, have an obsession with, of all things, Christmas carols. That’s right. White Christmas, Rudolph the Red-Nosed Reindeer, Let it snow…you name it, I love it. But while some of my friends choose to tease me about this unconventional fascination, my good friend, Meredith, made an astute observation. My list of favorite Christmas carols? They were all written by Jews. “Of course you love them,” she says! So, maybe it’s not so sacrilegious after all to love Christmas carols as much as I do. It’s true that Jewish holiday music doesn’t elicit the same degree of jolly cheer as your average good ol’ carol, but that’s where Coquito comes into play. 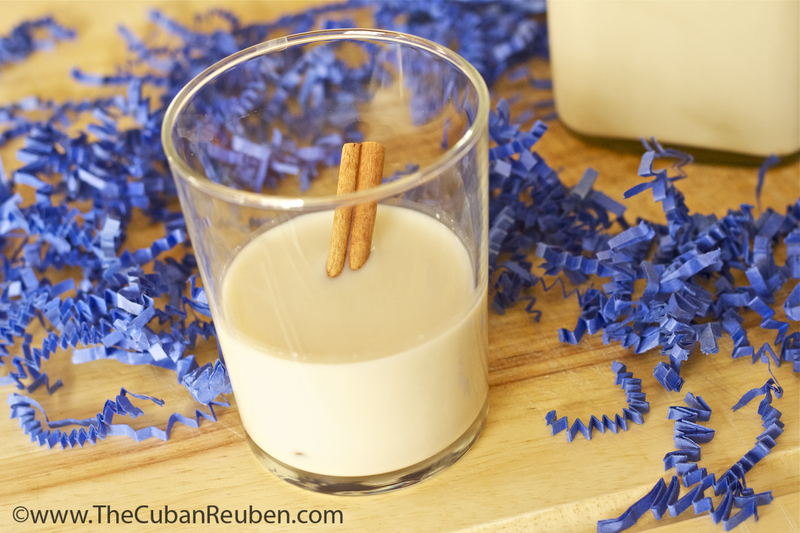 What better way to help bring out your jollies than to imbibe on a sip or two of the rum-spiked creamy Puerto Rican festive drink, Coquito? Particularly if you are being held hostage by a snowy blizzard, this creamy coconut cocktail that tastes like a tropical vacation in a glass, will not only help warm your insides, but might even loosen you up to the point of joining your friends as they go caroling down the neighborhood. Liquid courage never tasted so good. I’ve also served this for several New Years’ Eve celebrations to rave reviews. By now, my friends have requested it to help them ring in the new year. And for those of you whose resolution includes to shed a few pounds, don’t worry about the rich nature of this drink. I’ve tried this recipe using the reduced fat versions of the ingredients, and it still comes out quite tasty, though not as creamy. Happy holidays to all of my readers here at The Cuban Reuben. Let’s toast to a happy and healthy new year! 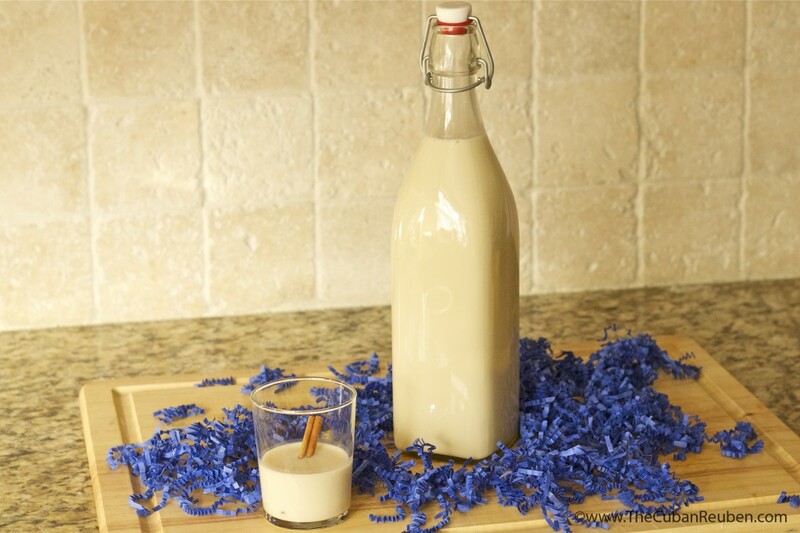 This festive drink will liven up any party, Christmas time or year-round. Pour all ingredients into a large pitcher, and stir until well combined. 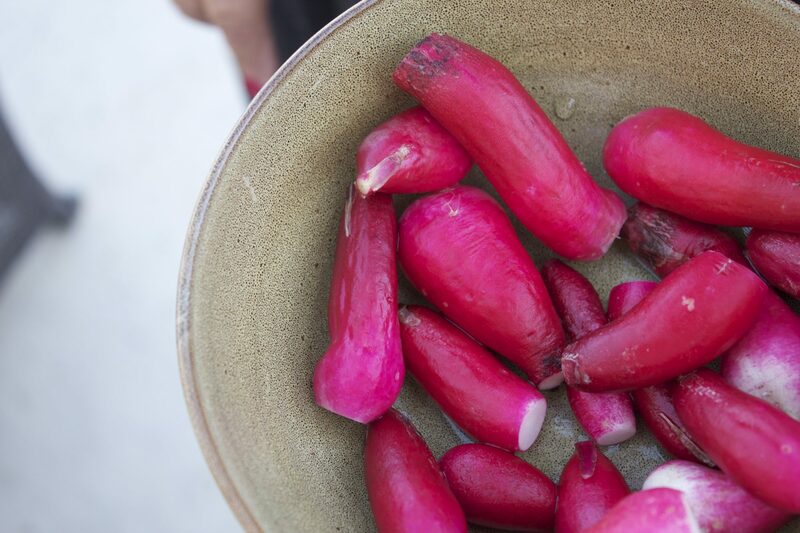 Store in an airtight container in the refrigerator for 5 hours, or until ready to serve. The longer the drink sits, the better the flavors marry. Sprinkle on some cinnamon powder to each serving, to really heighten the holiday flavors. Can also be made non-alcoholic by omitting the rum. In my not-so-humble opinion, the best party favor is an edible one. 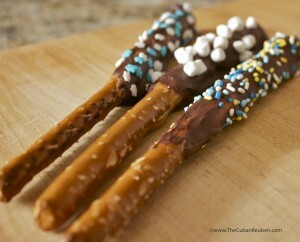 Recently, I was delighted at a friend’s baby shower when our delectable take-aways were these long, crunchy pretzel rods that looked as if they took a swim in a fine pool of chocolate. Once I bit into the sweet treat, I was in for an absolutely pleasant surprise, as concealed beneath the sheet of chocolate was the silkiest, stick-to-your-teeth coating of caramel. Although these dipped rods are reminiscent of a classic Twix candy bar, the specks of salt that decorate the pretzel elevate the whole flavor profile, making them nothing short of gourmet. I quickly dreamed up ways to decorate these in my own style, and after a jaunt to my local specialty food store, I found “Judaica” sprinkles. While these chocolate-caramel sticks made for great baby shower favors, they can also impress guests at your next adults-only event, and can be decorated with countless possibilities. Easily wrapped in cellophane bags or an air-tight container, these can be stored for up to one week. Place unwrapped caramels and water in a large microwave-safe bowl, and microwave for 1 minute at a time, until melted. Mix well between each interval. Once caramel is melted, dip pretzel rods in the caramel until the caramel reaches the midpoint of the rod. Use a spoon to remove excess caramel from rod. Place rod on a baking sheet lined with parchment paper, and let the caramel set. Melt chocolate in a double boiler. Once the chocolate is sufficiently melted, dip the caramel-coated rods in the chocolate, and let the excess drip off. Lay on parchment-lined baking sheet to set, and add sprinkles if wanted. You can put them in the refrigerator to speed up the setting process. Store in an airtight container for one week.